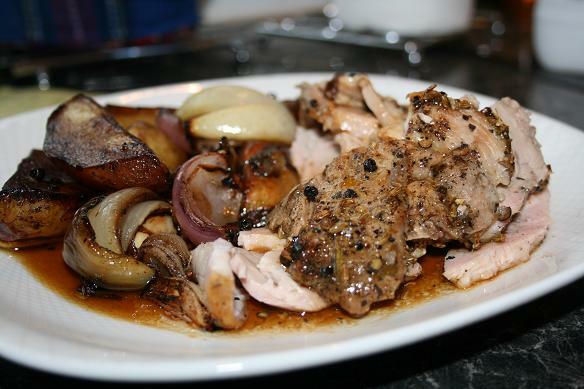 Tonight I made roast pork with balsamic potatoes and onions that has featured on a particular *cough* chefs TV programme. It took a lot of pausing the freeview box to get the gist of the recipe! I have to admit I liked it more than I expected. For the pork I removed the skin and covered the joint of meat in rosemary, fennel seeds, black pepper and salt. Bunged it in the oven at 200oc for 1 hour, then let meat rest for 10 or so minutes. While the pork was beginning to cook, I blanched the potatoes for 5 min, then put in a hot roasting tin with some olive oil. Placed a couple of onions and bulb of garlic in between the potatoes. Covered with about 200ml of balsamic vinegar, seasoned then baked for about 50 min. tip: don’t use your best roasting tin for the potatoes, the sticky balsamic mess will ruin it! If anyone knows why the formatting of text on my blog keeps on changing, please can they let me know!